US, 2005, 89 minutes, Colour. Directed by Penn Jillette and Paul Provenza. For some audiences, this will be an offbeat comedy. For others, it will be a test case for limits on language and themes on the screen. It is very easy to empathise with the representative of one of the American churches who found it both repellent and very funny. 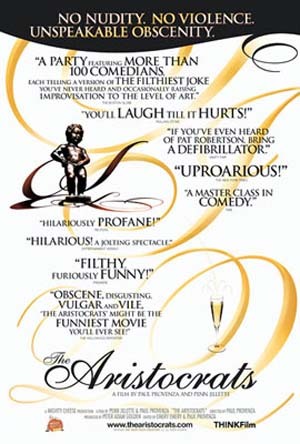 As George Carlin explains in his narration throughout the film and, as about 100 stand-up comics re-tell the joke, elaborating it ever more crassly as they proceed, The Aristocrats is a classic joke that combines vulgarity with an ironic punchline. The Aristocrats is a particularly American take on a stage name for the joke’s group who run a gamut of obscene behaviour. For non-Americans, The Sophisticates would work better. The question the film raises is, of course, how far can you go? While any content is possible for humour, it is always the ‘how’ of telling the joke that can cause the problems. The question also comes up about offending people. Is it OK or not to offend people? What about people with delicate sensitivities? What about people with more earthy and robust sensibilities? Where do community standards come in? The ‘offence potential’ of The Aristocrats is not visual but verbal. The descriptions of the aristocrats gets more and more scatological, focussing on sexuality, bizarre and taboo relationships and bodily functions, as the joke is re-told. Many well-known names and faces give their rendition of the joke. Whatever the merits of or objections to The Aristocrats, the makers have provided a 90 minute compendium that is available for workshops and seminars on censorship which should get participants going.